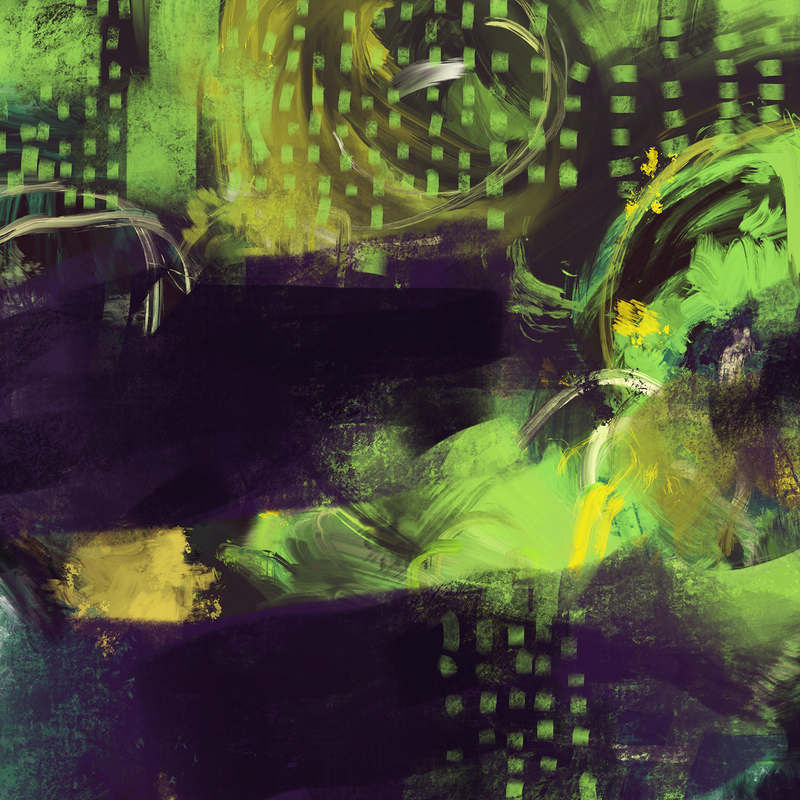 So, in recent days I’ve been thinking about abstract art. Naturally, I got on this line of inquiry through my stepfather’s artwork. The paintings he created after the onset of dementia. < a post about that). I’ve been spending more time with him lately, not exactly by choice (if I’m to be entirely honest), but because he needs someone around 24/7. We watch Netflix, or read, or, for a couple of days, I worked on these paintings. Sitting with him on the couch painting on the iPad. He was more interested in these than in a show. If I watch TV, he can’t follow it, so he just sleeps. These, he’d watch what I was doing for a while, and sometimes want to tap the screen himself. Even though he isn’t able to paint anymore, he remembers doing it. I was going to use these for a hilarious April Fool post. 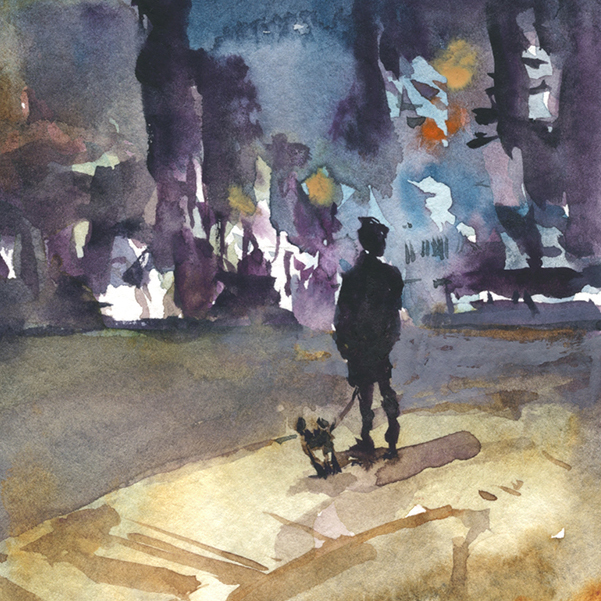 I was imagining a fake declaration about abandoning watercolor forever and switching to abstract art. It would have been super-funny. But eh. Who’s got the time for jokes. I’ve always said I don’t understand abstract art. Trying it for the first time, (even half-seriously) it feels like trying on a doctor’s scrubs or a fireman’s coat. Getting dressed up for a job – but it’s only putting on a costume. It’s true, when I paint on location, I don’t worry about slavishly rendering reality. Yet, I find it difficult to create entirely from imagination. I normally want to be looking at something, and then maybe I can break the boundaries of reality. 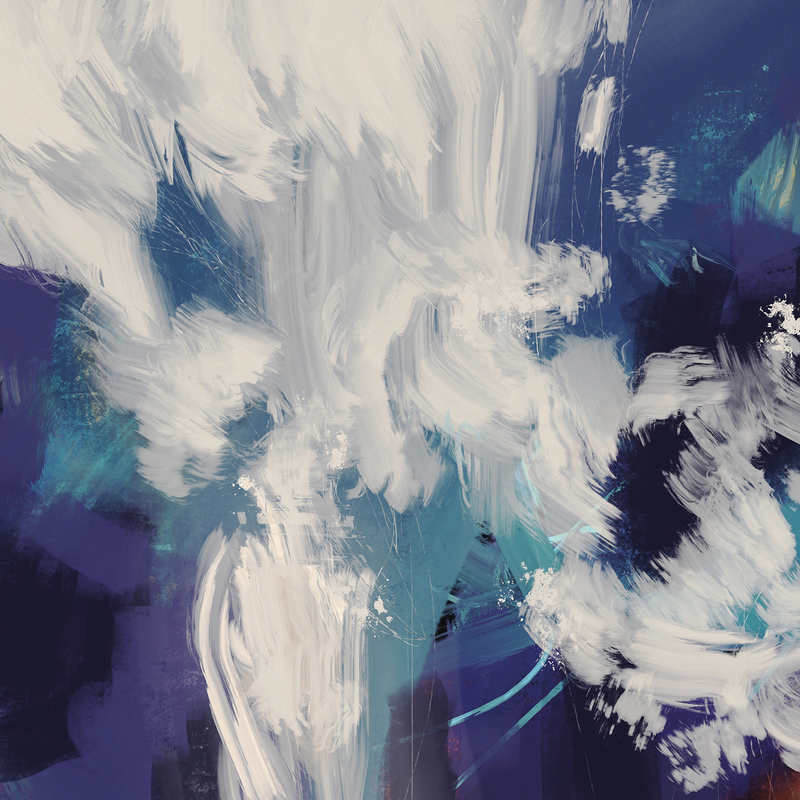 I will say – I think I’m short-cutting the real deal by painting digitally. You can try something, and if you don’t like it, undo it. There’s no element of risk. When you’re contemplating a big move on a traditional painting you feel real fear! Holding a dripping brush over the canvas, you’re afraid you’re going to ruin the painting, and really wish you hadn’t done that, and it’s going to take you hours to get it back, if ever. With digital, you don’t have any fear, or any boredom waiting for paint to dry, or any exhaustion from the physical effort. So, with this silly April Fool prank that never became a prank, all I can say is – you can’t learn anything about painting sitting on your couch. I think these are all fabulous! Hey, Marc—–these abstracts are really great! Thanks for posting! They are beautiful! Love the design of them. Happy Easter Marc. I agree that painting with real paint on paper or canvas is the way to really explore this.. and it might take time to get in the grove..shutting the monkey would be the first step to let yourself express your feelings in an abstract painting.. I suggest listening to an audio book or music to get the monkey something to do.. there by letting your right brain paint..abstract painting is all about your emotions, you have to let it all out. Get lots of paper, canvas or whatever you use as your matrix and just paint and paint. Knowing you, the process will happen quickly..
Look up Emma Larrsen..she has some amazing abstract watercolors, you don’t have to go to oil or acrylic..
of them and not others. Hey Lilliam, yes these square ones today, I painted. But I was inspired to do them because of my stepfather’s work. These paintings are wonderful! I love looking at abstract art. Its on my bucket list to try. I watched my mom (similar situation) try to piece together two puzzle pieces yesterday – I am very patient. Mom doesn’t like to “color” – I tried interesting her with popular “adult coloring books”. But iPad painting might be just right! I had not even considered that. For the reasons you mention… no worries, no mess…she may be willing to engage!! 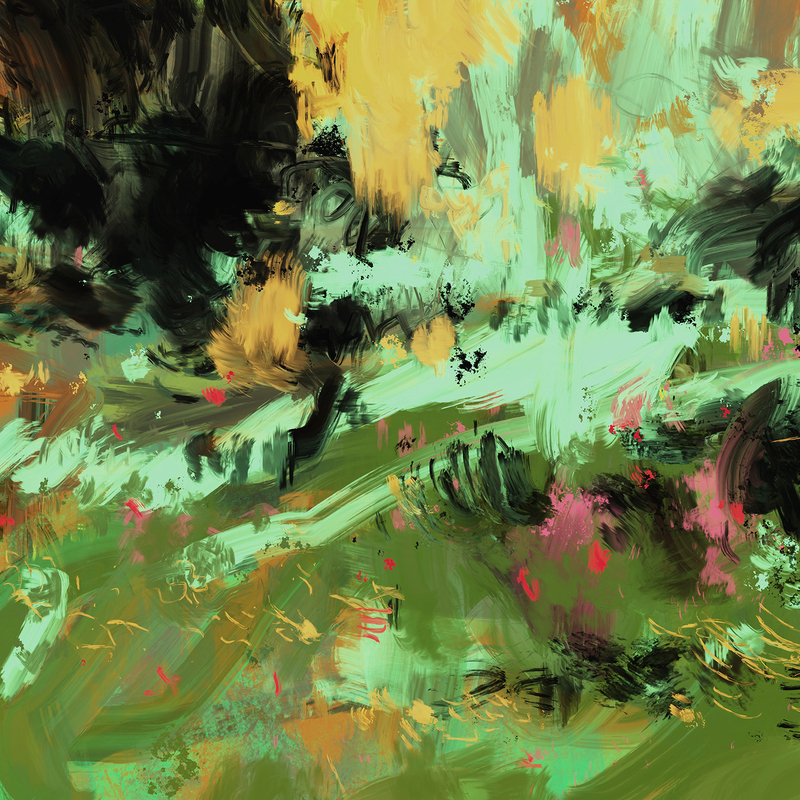 I have an old iPad something or other with some painting program installed. hmmmm…. Although a good April Fools Day joke could’ve been fun…this was great! 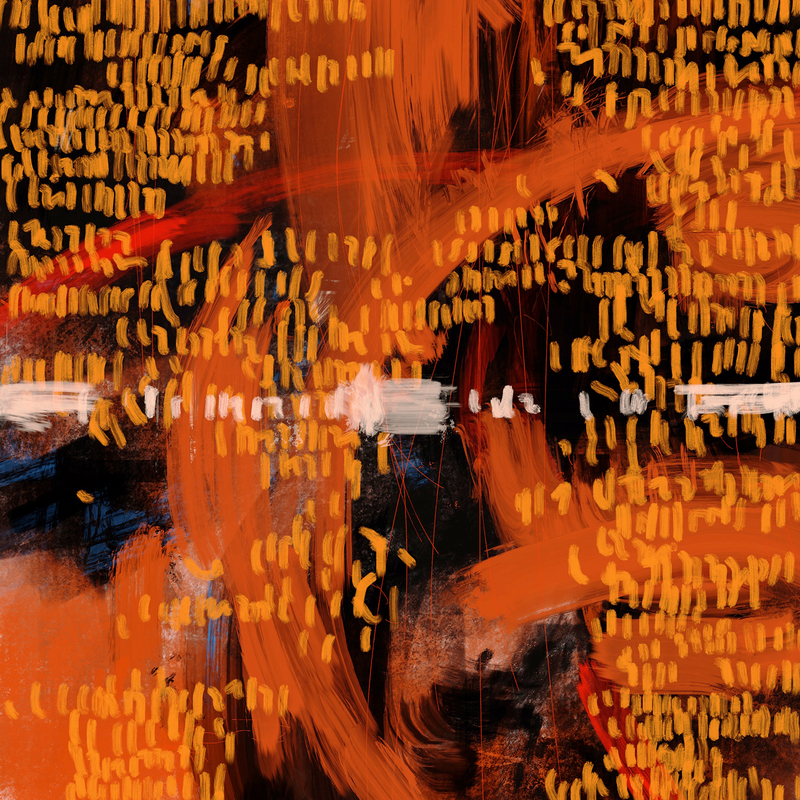 It’d be fun to see more of your abstracts if its not a passing fancy…. Happy Spring Mark! 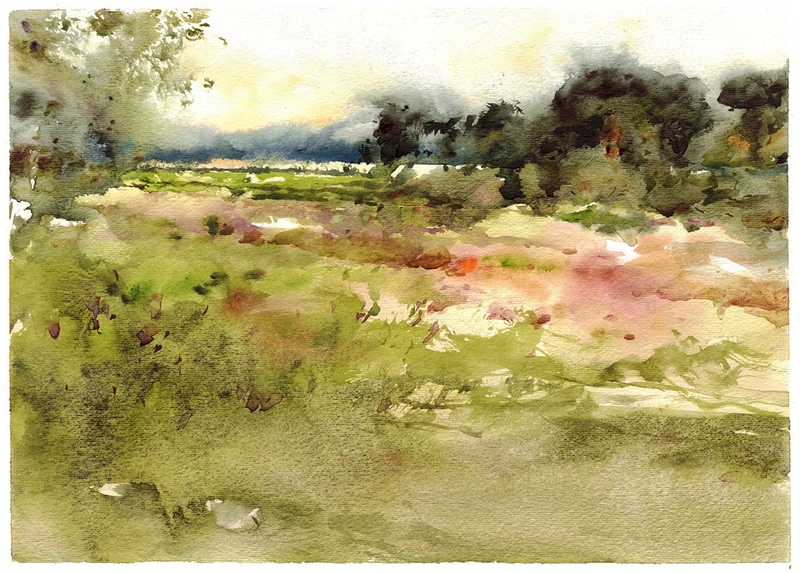 These paintings are a wonderful example of Markmaking using a brush. Sometimes is it it’s just good to break out of the mold and explore. And engaging your father-in-law in the process even for a few marks on the tablet can be rewarding . Have fun, because that’s what it’s all about. Thanks for sharing. The story about your step-father strikes a poignant chord. 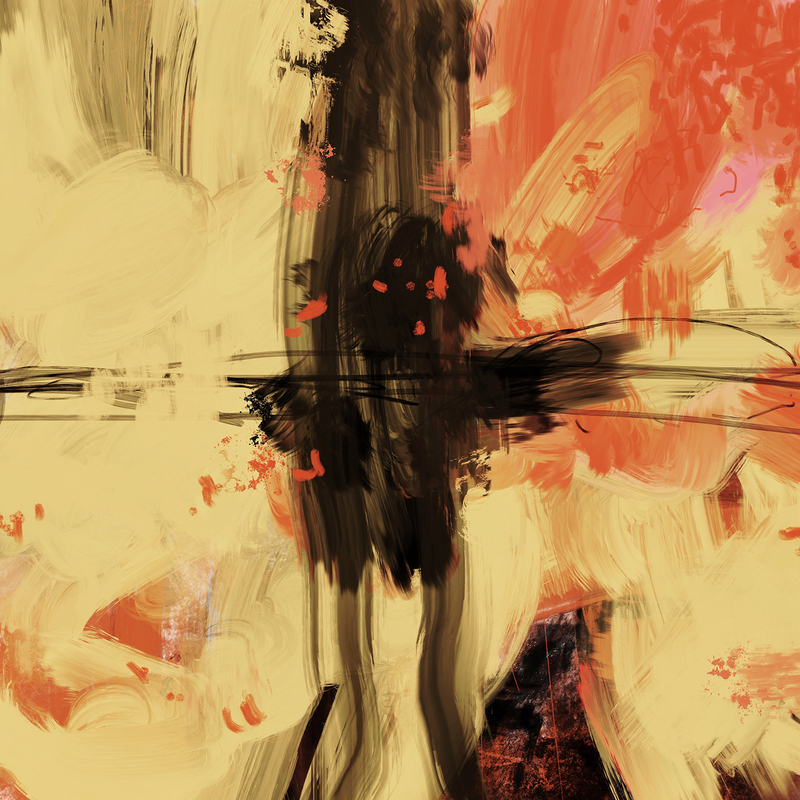 I’d say you really got into the swing of abstract painting really well….the rhythms, movement, keeping the eye moving around the canvas (or screen), the in and out, light and dark…all the same elements of regular painting but unhinged from things! Go for it! You made it look easy! I agree with your statement totally about painting digitally. I am on my iPad Pro all the time even as I type this. Have tried drawing and painting on it several times and just can’t get into it. There is just something about paper, pencil, pen, ink, graphite, paint (watercolor). That you don’t have or feel with a fake pen. For me I guess it’s feel thing and also look, response of the pen to paper over fake pen/ stylus. Just not for me! Well, that must have felt very strange for you doing the art on a screen…. probably a bit like how your step father feels engaging with reality. Very difficult for yourself… and for him too. Interesting to see the painterly effect rendered on the screen. I bet you desperately wanted to know what your step father was making of his and yours creations. It’s wonderful Marc that you are still engaging your step father in what he had enjoyed so much in the past. Thank you so much for sharing this Marc. Probably not the easiest day for you but hey, I think both of you have gained from it. Thank you. Ps we could never have believed your April Fool’s prank anyway! Thank you again Marc. Hang on to your sanity however you can through this life adventure. Someday this closeness to your father at this difficult stage will be a most valued transition. I actually have a neighbor who was just diagnosed with early onset Alzheimer’s and is having trouble with reading and other daily activities and because I read your post I suggested painting to him . He said his doctor suggested the same thing . Keep posting! I love all of your posts ! Dear Mark, Perhaps without knowing it, you are providing a valuable ministry moment with your step father. You have found a way to communicate in a unique way which connects you in a profound way. I admire your attention to his needs. Those are really terrific and very interesting. Never mind the mind, just see where it takes you. Before I read your descriptions, I thought you were again posting your step-father’s works. It is kind of you to think your art might encourage him to try again. When I work with patients who are late stage dementia or Alzheimer’s often it is my one on one attention that brings about meaningful moments.Sometimes, it is just the attention and sincerity that gives them a time of clarity. Your iPad paintings are lovely. You are giving your step-father a precious gift of your time, talents and opportunity. My husband died this very day, just five years ago, at age 66 of Alzheimer’s. I have found your post today very touching. I remember that journey all too well. Very good of you to travel it with him. Love your abstracts, by the way. I’ve become an ‘urban sketcher’ myself and love your work/books/classes on the subject. Carry on! Very sorry to hear Claire. That’s was young. Best to you today. Yes, I too found your post very touching Marc – I went through the journey with my father-in-law years back. On a lighter note, thank goodness you didn’t post your April Fool’s prank – the hearts of thousands of us around the world would have stopped. I had a sharp intake of breath as I open up your post, headed “A New Manifesto”. I had to hold that breath as I read the first words “I’ve been thinking about abstract art”…there was a distinct disturbance in the force. Ah – balance was restored. I’m not meaning to trivialise the situation you’re dealing with and I feel for you, and I love the care and attention you are giving to your stepfather. As we say in the southern U.S., “good on ya” for spending time with your step father. I know from experience you’ll be very glad you did. Neat abstracts too. Don’t stop doing that… at least until next April’s Fool !! I admire you for your care-giving service. I tended my father-in-law full time for the last three years of his life as he succumbed to Alzheimer’s. As he slowly lost mental capacity, I had to think for him and dicipher his “motions of living”. Such as when he held an empty dresser drawer on end and kept shoving a shirt at it, he was actually trying to make toast. When he wanted to eat, he would take his dentures out of his pocket and stir the teeth in with his beans. He knew teeth and eating had a relationship but he just couldn’t figure out how. The paintings remind me of the “motions of living” where color and stroke represent a slice of real life, just not put in the order we’re used to. Blessings to you as you continue to help your stepfather. And your abstract art paintings are perfect and meaningful just as they are. 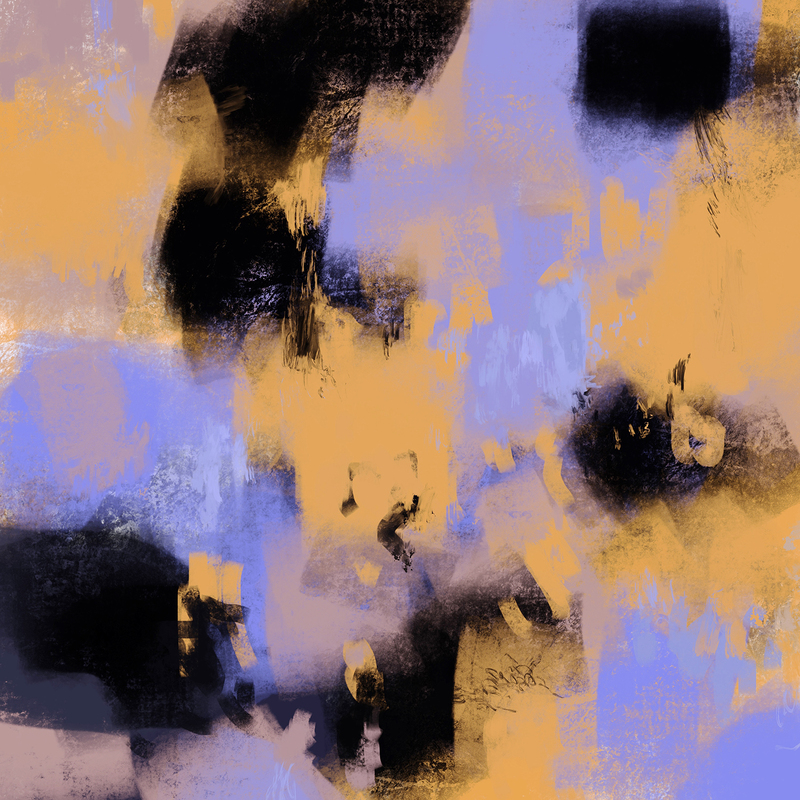 I dig the digital abstracts. Doing similar work has brought me back into my love for Abstraction- and creating! The iPad Pro with Apple Pencil along with the fabulous apps available have really gotten my personal muse chuckin and jivin. Keep it up! May I ask, what app did you use? PS just bought your new book and have bought a series of “mini” paintings that you did. Really enjoy your free flowing approach (pun intended!). PSPS, so sorry to hear about your father. I lost my Mom to Alzheimer’s and my sister. I tried digital art too, and it did not feel authentic. I admire digital artists and designers, but it’s not me. Stick to what you do. I don’t really care for abstract art, but I admire you for for what you are doing for your father. My father had OLIVOPONTOCEREBELLAR ATROPHY OR OPCA and was in a wheel chair for 19 years, the last 4 years he couldn’t communicate that we could understand. Very tough on the family especially my mom! Appreciate his lucid time and do what you can to make his life even a little meaningful. The Lord will reward you for the acts of kindness. Love your site and look at tour pictures over and over!